www.interrose.co.uk sent me a blue rose today as part of their blue rose campaign for Eros Day. The blue rose is very cool. It arrived with beautiful presentation in a custom box. I am happy to recommend www.interrose.co.uk for anyone who wants to buy blue rose. I have blogged about Interrose before and I am pretty sure that they sent me the rose so I would blog about it- it worked! I have not been paid to write this post. Why am I blogging about it? Because I think it is a cool marketing campaign idea to create a day dedicated to love (and, of course, to promote roses and rose sales). It’s great to get a gift in the mail, almost as great as the feeling of sending a rose to someone you love. Blue Roses don’t really exist in the commercial world, but some innovative Australian and Japanese scientists have discovered the holy grail of the rose world! They estimate that they won’t be able to order another set of blue roses for 3-7 years, leaving us all to get only the dyed version in the meantime. So if you want to get one of these limited edition blue roses, now is the time. 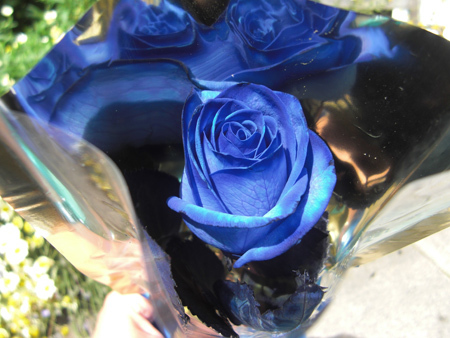 They create a very beautiful, crisp blue rose that will blow you away! Great gift!